We offer a comprehensive portfolio of corporate and commercial interiors. Mc Creery can offer clients a one stop solution to Fit out, Refurbishment and new build one off housing. Our management team have a vast amount of experience between them with a wide variety of projects from commercial and industrial to retail and residential. Mc Creery can offer clients a one stop solution to Fit out, Refurbishment and new build one off housing. As a company our core philosophy is exceptional quality for exceptional value. Our management team have a vast amount of experience between them with a wide variety of projects from commercial and industrial to retail and residential. Mc Creerys core of experienced staff allows it the ability to excel under any contract from traditional building contracts to management contracting and design and build, and provide a level of finish and service that will personify what our clients stand for within their field of business, quality and professionalism. As a company we pride ourselves on our ability to deliver projects in occupied buildings while ensuring the client is not inconvenienced or disrupted in any way, Mc Creery can offer clients a varied selection of options and methods to keep their business running smoothly while updating and altering their offices or premises to their new requirements. 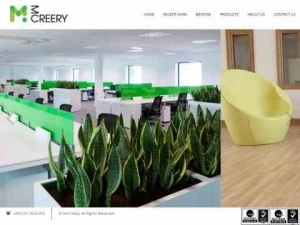 McCreery has been developed to offer clients what they require, a professional site management team, a quality finish to their projects, and a company with a strong financial position with the ability to deliver their project on time. Designing and producing bespoke Joinery in house. Our Service includes a full in-house 2D and 3D design and schedule facilities combined with a fully computerised and automated factory facility. Our craftsmen produce and deliver only the highest quality product utilising our extensive knowledge of all aspects of design, manufacture & fitting. We source wood and materials from sustainable sources worldwide to create the highest quality finish.